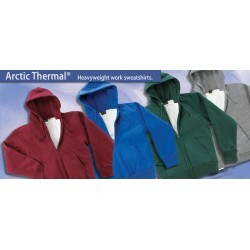 Insulated Sweatshirts There are 3 products. Made in USA. 12.5 oz Shell, 6.5 oz Thermal Lining. 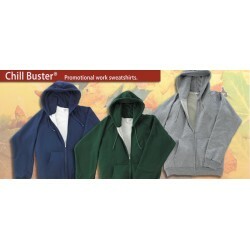 Heavy Plastic Molded Zipper, Muff Pockets, Drawstring Hood with Brass Eyelets. Extra warmth for Extreme Cold. Made in the USA. 7.5 ounce shell, 6.5 oz. thermal lining, Aluminum Zipper, Drawstring Hood, Muff Pockets. Perfect for most climates. Made in the USA. 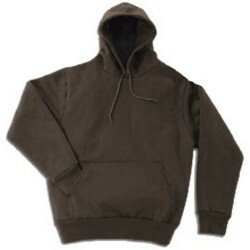 Hooded Thermal Pullover Sweatshirt. 7.5 ounce shell, 6.5 ounce Thermal Lining. Drawstring Hood, Muff Pockets. Perfect for most climates.